Milan, Italy: – Filtration specialist Bea Technologies will display its latest and most innovative high quality pharma filtration solutions at the upcoming Pharmintech Expo in Bologna. 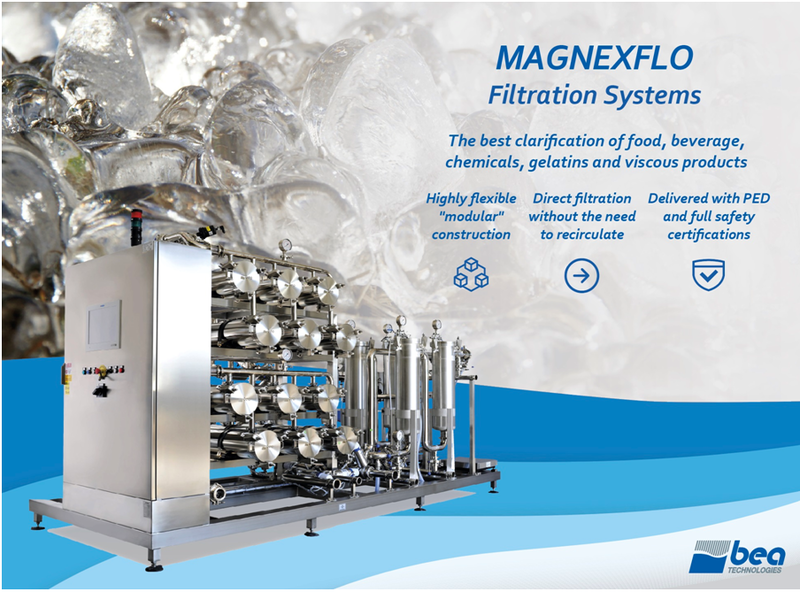 The Bea Technologies stand at Booth 26 in Hall 16 of the Bologna Fiere Center will feature its latest innovative filtration and nano filtration solutions for pharma manufacturing including its, Valex Potent for HPAPI filtration solutions and MAGNEXFLO modular platforms. 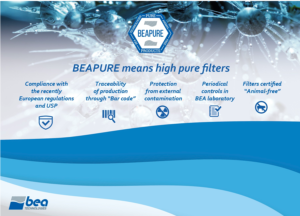 The BEA display will also showcase its recently developed BEAPURE ‘animal-free’ line of high- pure filter elements not containing any parts or additive of animal origin. These incorporate “purer” polymers, including filter elements in Nylon 66 membrane . BEA manufactures even positively-charged membrane in Nylon 66, used to remove endotoxins or other very fine contaminants negatively charged from different liquid solutions, alongside filter elements made with PES and PTFE membranes and a series of filters containing borosilicate fibers and nanofibers. 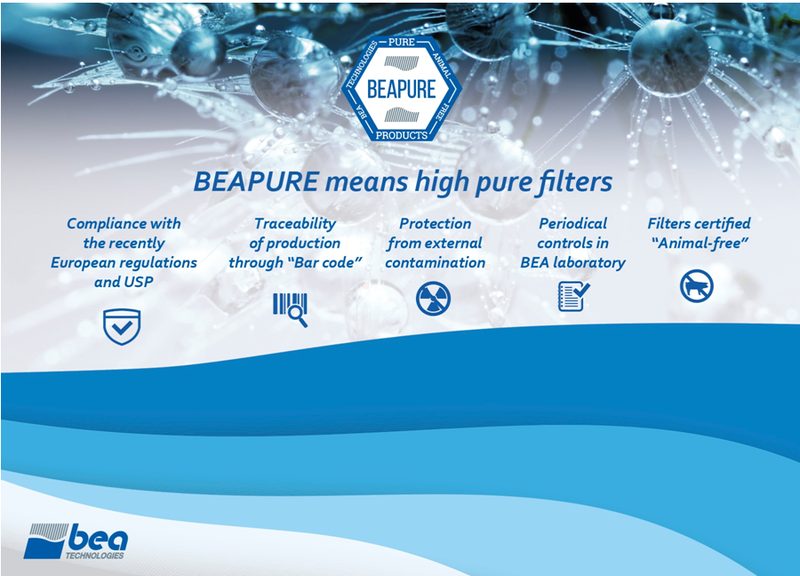 BEAPURE filters are ideally suited to sterilization and for the removal of bacteria and microorganisms from liquids and various solutions in drug manufacturing processes. The BEA Technologies team in Bologna will be led by Sales Manager, Marco Pandolfi, Biopharma Development Manager Marco Burato and Export Sales Manager Gianluca Colombi. “This is a return for us to Pharmintech, which is an excellent event to connect with the most enterprising and innovative small to medium-sized pharma manufacturers and suppliers in Italy and across Europe,” commented Mr. Pandolfi. “We will be able to show the Pharmintech audience that BEA should be the first port of call when seeking innovative and high quality solutions for filtration and filtration of toxic, viscous or purification of different solutions,” Mr. Pandolfi added. Bea Technologies S.p.A has been an active presence on the filtration market for the last 50 years, working successfully worldwide in various sectors, including beverage, chemicals and pharmaceutical markets. The company manufactures a wide range of innovative and high technology products to filter both solid particles and microorganisms, removing them from liquids, air and gas. 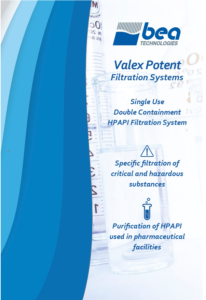 The filters are produced in a certified cleanroom, in a controlled environment that is constantly monitored by computer systems to ensure that it complies with GMP (good manufacturing practice) requirements. Internally, the company is structured in such a way as to be able to guarantee, through its commercial service and laboratory service (SLB), timely and expert consulting service and after-sales assistance. The headquarters in Pero, just outside Milan, based on three facilities which occupy a surface area of 12,000 sqm. In the plant there are two cleanrooms where the company produces all its membrane filters and filter elements for use in food and pharmaceutical applications. In 1994, BEA became one of the first filtration companies in Italy to get its Quality Assurance System certified in accordance with the requirements of the ISO 9001 standard. PHARMINTECH is the international exhibition for the pharmaceutical, biotech, nutraceutical and cosmeceutical industries, displaying the most advanced technologies from Italy as well as the most innovative solutions offered by worldwide manufacturers, attracting industry professionals from all over the world. PHARMINTECH 2019 is a three-day event opening April 10 at the Bologna Fiere Exhibition Center. Followed by the Cosmofarma Exhibition (12-14 April 2019), Pharmintech forms a central element of Bologna Health Week as an international forum covering the pharmaceutical sector’s entire supply chain. (Italian Enquiries): Marco Pandolfi, Sales Manager, Bea Technologies S.p.A.
(Enquiries from outside Italy): Gianluca Colombi, Export Sales Manager, Bea Technologies S.p.A.
Click on Bea Technologies at Pharmintech 2019 for more information. Click on Bea Technologies to contact the company directly. The BEAPURE line of animal-free filter elements contain ‘pure’ positively charged polymers in Nylon 66 membrane along with PES and PTFE membranes for removal of endotoxins or other very fine contaminants from liquid solutions.